It’s been a quiet weekend | carpe diem! in part due to intermittent internet access. Probably rock-solid while I was out. Also in part due to the cats and I having the house to ourselves. It’s very quiet indeed, and I get to drive his car (Polo TDi) which I must confess is quieter (and nicer) than mine (ancient Polo 1.4). Don’t tell my car I said that, or it will seek revenge. I must remember to do ‘Six Weird Things’ sometime. I want to prove I’m weirder (is that a word?) than the majority, which is in itself a bit strange. First, my sincere apologies for not posting this earlier. Mrs J (Sue) and Alice have won birthday prizes… parcels on the way as soon as I know where to send them. I promise to include only nice stuff. Well, stuff I think is nice. Anyone not wanting chocolate should speak now or forever hold their peace. 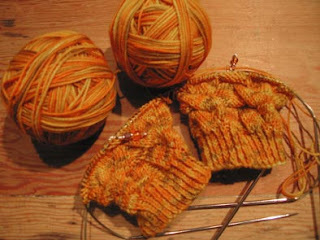 Almost forgot: the pattern is Cookie A’s ‘Monkey‘ in Kirsty’s ‘Seat by the Fire‘ hand-dyed sock yarn. 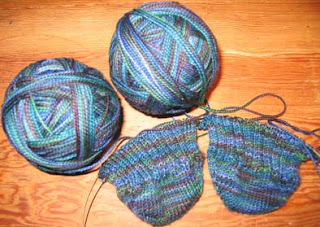 Incidentally, if you’re in need of a cool and complex sock pattern, check these. This entry was posted in Uncategorized on March 18, 2007 by sarahw. Sarah, thank you for…making me stop and think about hens’ teeth (! ), the link to those great sock patterns, reassuring me that there really are knitters out there, just out of sight though they may be (real-people knitters), and for THE PRIZE. And also for such an enjoyable read every time!I really like that glorious, buttery yarn, by the way. Mmmm. Wry and insightful, as always, Sarah. I missed out on acquiring the Piece of Beauty yarn I wanted. It looks so lovely in your Monkey sock.